← Healthcare – A Right Or A Privilege? I somehow never built castles in the air. It is said that a man’s home is his castle and even that home that I bought was due to an unplanned for development. I have not however, regretted the purchase and in fact, it is indeed my castle. I also flatter myself that I am neither a neurotic nor, psychotic. I neither pay or collect rent and so I am not qualified to be a psychiatrist. I however did consult a psychiatrist a couple of years ago for a spell of clinical depression but, I don’t think that the experience is relevant to this discussion. So, what am I? Just a lucky old geezer! Grateful to have had his feet firmly on the ground all his life. How about you dear reader? Have you built castles in the air? This entry was posted in Gratitude, Humor, Language and tagged Jerome Lawrence. Bookmark the permalink. 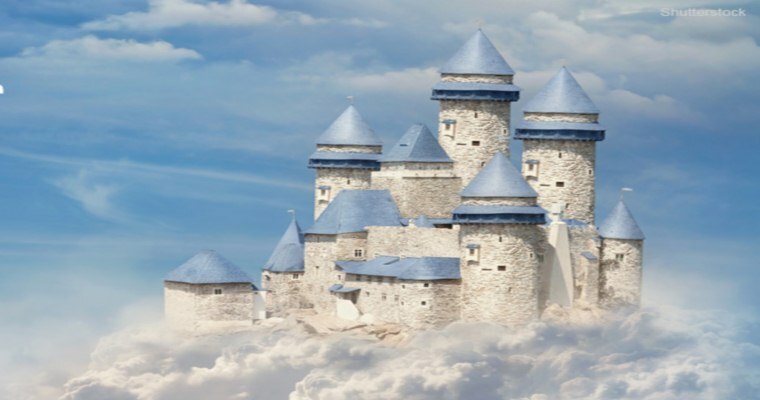 21 Responses to Castles In The Air. A lovely way to be indeed. I never under stood the term “A man castle is his home” I find it a sexes statement. It’s not “sexist”. “Man” is just a generic term as in HUMAN. The day the term “HuWOman” becomes currency is the day I hope I’ll be in my grave. I too wonder about the expression ” a wo/man’s home is their castle” but, clearly, for reasons different to yours. A grand way to have lived. And always remember, we did it in style too! I do not recall hearing this idiom before, but apparently it was first used in the 1500s! I try not to! i’m not aware that I ever built castles in the air. and growing up in this materialistic/capitalistic country it was probably hard not to! I lived such a simple nomadic early life that it never occurred to me to have a home built just for me! did I feel not worth it? NO! not at all! as to other psychological castles… yes. I fell for the American apple pie and mom just like the rest of us who have been enlightened here. in the last years of study it turns out this country didn’t hang the moon! and ‘oil’ has been the greedy issue for ages. oh how little we knew and how late we learn the truth. or at least the true facts! there are many castles in that respect that have tumbled for sure. it has been embarrassing and confusing and amazing all at the same time. And what have we lost by not having built castles in the air? I think that the three of us listed by you, have lived full and fruitful lives and can look back with satisfaction. I don’t subscribe to being categorized. Building Castles in the Air doesn’t make me neurotic. I’d call it day dreaming. It’s good for you. And I defy anyone who tells me they don’t daydream. If you don’t you lack imagination. As to disorders of the mind, yes, sure, a psychiatrist does make a mint out of them. Not least because in recent times, and more and more so, even the most normal human reaction is made into something you should see someone about. Ursula, you will be surprised as to how many people lack imagination! In my opinion, they are blessed because they don’t simply have it in them to imagine bad futures! I guess we all start out with dreams. I had a very tiny few which all came to pass and very quickly too. Am I fulfilled? Yes. I have a rich interior life and a good circle of friends and companions. I can get into loss but choose not to apart from a self-indulgent few minutes a day. I’ve sought help when I needed it: grief counselling, child abuse therapy, addiction, etc. So I am content. And am grateful for my now much smaller life. Economics at early stages of life can make the difference. In my case, it was sufficient for me to survive with some semblance of joy. I did not have the time to day dream. Many things that eventually led me to be successful happened despite me. And believe me you, I am grateful for that. Castles in the air are dreams that will never come true, apparently. So yes, I’ve built a few of those. I’ve always loved to daydream…you could call it a futile, but enjoyable pastime, I guess! If I had to put a name tag on myself – it would be a ‘realist’ – I don’t dream of visions of grandeur; building myself a castle somewhere; or any so-called far-fetched dreams. I see where I am today, look back on how I got here and appreciate the fact that I made it to where I am today. As long as I wake up in the morning, am moving and am still able to put one foot in front of the other and go about living and by that I mean doing whatever it is that I intend to accomplish for that day – well, I am a happy camper. Do I envision things I would like to do or plan on doing in the future – sure – but only those things I know are within my reach both physically and financially. At the end of the day, if I accomplish these few things, I consider myself to have had a good day! Irwin Lengel recently posted..I Need to Find Myself! Thank you for visiting and commenting. Realist is a good way to describe our kinds of people. That is how I would describe myself too. The nearest I ever got to building castles in the air was my teenage fantasy of becoming a world-famous author. It didn’t take me long to realise that I just didn’t have what it took and that anything over about 500 words just became a big struggle. Other than that, I’ve never built castles in the air, I’ve always been a beady-eyed realist who makes the best of what I’ve already got. Max Coutinho recently posted..Africa as a Safe Haven for Terrorists: Who Will Fix the Problem? I am not surprised at all Max.